775 DIAMOND Fl Go 77/ MATCHING. ôo.volumes projected into veneer patterns. ing, is one of the simplest and most satisfactory; while Figures 77B to 77F are self-explanatory, matching methods. Occasionally, the diamond pattern is formed into the herringbone design, but its use is not to be encouraged. Frequently a small veneered unit is advisable as an accent. This unit must be nonobjective; that is, of geometric or abstract character. Commercial inserts, such as sea shells, monograms, flowers, and fruit, should never be used, being out of spirit with the functional character of modern design. Panels are depicted in Figures 77F to 82, Plate 10. Figure 80 suggests motives of the unit type. The circular insert is based on six segments of the hexagon, with the graining thrusts well planned to balance. The remaining inserts are based, rather appropriately, on the volumetric mass in its isometric rendering. In Figure 80, A, is the isometric cube with its planes adapted to three pieces of veneer. In B, the same form has been used, with the top and invisible base used as two spots: the sides are obvious. In C, the base of the isometric cube A has been made smaller, while the forty-five degree triangle has been used. There is a slight hint of the original volumetric mass used as a basic form for the unit. D, Figure 80, is similar to A, but with a low rectangular form utilized. The panels of Figures 81 and 82 are based on projective enrichment. In the panel of Figure 82, the diagonals are first drawn. In one corner, the rectangle a, b, c, &, is drawn, similar in proportion to the panel. A second rectangle is drawn at e, f, g, h, by connecting a, e; b, c, f, g; d, h; the original rectangle is projected or extended to the lower corner. The same procedure with i, j, k, I; m, n, o, p, gives us an underlying pattern or net upon which the veneered pattern directly above has been formed. In Figure 81, the same procedure, varied by the rectangle a, b, c, d, gives a pattern from which the veneered panel directly above has been evolved. The methods of Figures 80, 81, and 82 are suggested, not for the advanced designer, but for beginners, indicating, as they do, geometric types of desirable patterns. By varying the sizes of the rectangle, an almost unlimited number of differing designs are available; but the designer is urged to develop his own net. Borders of veneer often are effective methods of surrounding panels, table tops, and similar objects, frequently appearing around the diamond pattern. 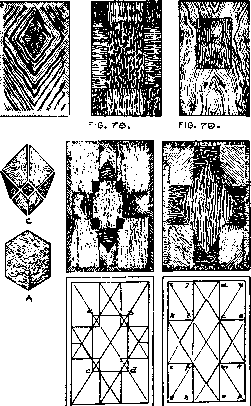 Their grain planning is shown on the designs of Plate 10. To avoid monotony, each section of a veneerecl design should show either a contrast of grain direction or a difference of value or color. Quicker and cheaper transportation has brought to us from the world's markets a flood of new woods suitable for veneering. Some of the new varieties cannot be manufactured successfully into veneers, but a number have survived and are among the best species of cabinet woods. And so it is that we have these beautiful, new woods usable by reason of veneering when, as is now readily understood, solid woods would be both too expensive and inexpedient. Satinwood. This tree is a native of India and Ceylon and grows to moderate size. Most of the satinwood used in the United States comes from the East Indies. The wood is hard and of a light-yellow color with a rich, silky luster. The grain is close, straight, and sometimes mottled, and the wood is hard but works well. Quartered Oak. About thirty-five of the fifty-three species of oak found in the United States are commercially useful. Of these, the white oak is most extensively used for furniture and veneering and has always been one of the most popular of native cabinet woods. It is hard, tough, and durable, with a handsome grain. The natural color of oak is light tan or yellow. The tree from which this fine wood comes is a native of Queensland, Australia, where it is used freely for cabinet work. It is known under several names; among them oriental walnut and Australian walnut. The wood is subject to wide variations in color and figure, varying from a pinkish background, with shades of brown stripes, to a deep brown with gray, pink, and brown stripes. The figures may be faint or strongly marked, and are usually broken, striped or mottled. The structure is open-pored, close-grained, and the wood works well. A product of the trees of West Africa, Zebrawood is fairly hard and dense but works well. The name is derived from the appearance of the wood when cut on the quarter, as the figure results in a series of parallel stripes-dark brown or black on a light-brown or tan background. It is often used as a border for setting off other woods. The commercial name ''mahogany'' has been applied to several species of trees, about forty varieties being sold as mahogany. The African species is popular for veneers. The heartwood is a deep pink color when cut but turns to a rich, brownish red upon exposure to light. It usually shows a broken-stripe figure, alternating between light and dark shades. This wood comes from Australia and is sometimes known as Australian silky oak. Usually rose brown in color, it has a slight luster and is marked by small flakes of light orange which stand out from the rest of the wood, giving almost a polka-dot design. Lacewood is moderately hard and heavy. Japanese Tamo. Native of China and Japan, this wood is also known as Japanese or Manchurian ash. It is heavy and tough and in color ranges from light tan to a rich brown or light gray. Sometimes the figure is a narrow stripe and again it may be made up of all kinds of twists, curls, and whorls. Curly Maple. There are a number of species of maple found in the United States, the sugar or hard maple furnishing practically all of the wood used for furniture and veneering. The wood is dense, heavy, strong, and very hard. American Walnut. Another favorite wood for furniture, the American walnut is well known to architects and interior decorators. Of varying shades of dark and chocolate brown and marked by distinctive figures dependent upon the method of cutting, the wood can be used to obtain unusual and most effective designs. It is heavy, hard, and strong and works well. English Harexvood. Silvery gray in color, with a strong, rippled cross-mottled figure. Prima Vera. A light yellow-colored wood. Some sections have a straight, striped figure; others a beautiful, broken, cross-mottled figure. 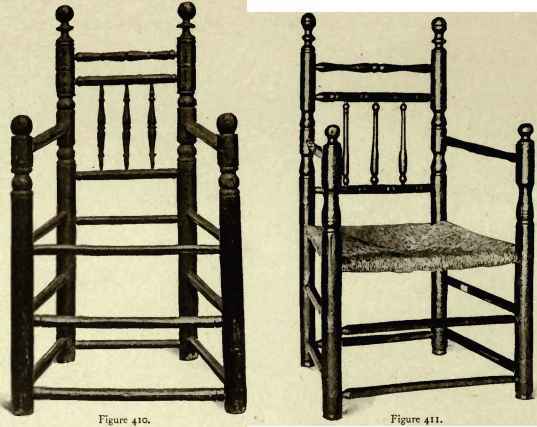 It is used as a substitute for satinwood. Brazilian Rosewood. In color, this wood is a rich brown; it has a straight grain. The wood is hard and produces an excellent texture. East Indian Rosewood. A dark-purple wood with a straight stripe. Macassar Ebony. A black wood with small white markings. Used effectively in modern design. Macawood. Rich, reddish brown in color with darker, straight stripes fairly regular in placement. The commoner and less expensive woods are rich in beau tiful figures and firm in texture. Usually sap knots, mineral streaks, and similar effects are excluded from matched veneers. In the list of common woods are found birch, pine, maple, cedar, oak, poplar, bass, chestnut, walnut, gum, and fir. Some of these woods are found in previous lists but this grouping gives the less expensive selection and affords ample opportunity for the beginner in design. Certain common woods have a number of cuts available on the market; as quartered, rift-cut and flat-cut oak, curly and bird's-eye maple, figured flat-cut and figured quartered walnut, giving adequate variety in the low-cost range. Butts: (slightly distorted, parallel-grain pattern) ash, maple, and French walnut. Crotches: avodaire, mahogany, oak, Brazilian rosewood, Circassian walnut. Burls: ash, French elm, maple, poplar, redwood, Circassian walnut.